Advanced high-strength steels are complex sophisticated materials containing multiphase microstructures and chemical compositions resulting from precisely controlled cooling and heating processes. These steels possess a yield strength of 550 MPa and tensile strength of 780 MPa. They offer high strength and optimized formability, which allows weight reduction and design freedom for various types of crash components and structural reinforcements. Increase in penetration of lightweight components, particularly in automobiles, growth in consciousness toward decreasing the GHG and CO2 emission levels, and the rapid growth in automotive industry drive the global advanced high-strength steel market. In addition, fast growing aerospace industry and accelerating urbanization and industrialization in developing economies is projected to create lucrative opportunities for vessel manufacturers to integrate AHSS grades in the industry. However, availability of substitutes and lack of awareness of the new steel across other industries is projected to impede the global advanced high-strength steel market. The report segments the advanced high-strength steel market based on grade, end user, and region. Based on grade, it is divided into dual phase (DP), complex-phase (CP), transformation-induced plasticity (TRIP), and others. DP steel is increasingly used by carmakers in the present car models. For instance, as of 2011, Chevrolet Volt's upper body and lower structure is around 6% and 15% dual phase by mass, respectively, which includes reinforcement of rocker outer panel. Based on end user, it is classified into automotive, construction, and others (power generation and shipbuilding). The automotive industry generated the maximum revenue in 2016. By region, advanced high-strength steel industry is analyzed across North America, Europe, Asia-Pacific, and LAMEA. North America accounted for the highest revenue in 2016, owing to upsurge in demand for lightweight vehicles and rise in efforts to conform to the fuel economy standards. For instance, Nucor Corporation is working on developing third-generation AHSS for automotive application. These new grades are stronger and are used in lesser quantity, thereby saving maximum weight. 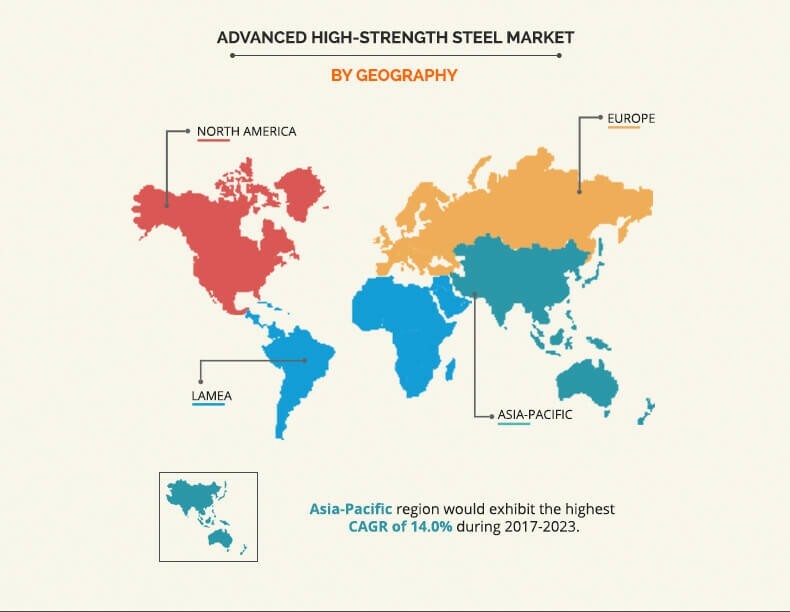 The prominent players operating in the global advanced high-strength steel market have strategically focused on product launch as their key strategy to gain significant share in the market. The key players profiled in the report include Tata Steel Limited, ArcelorMittal S.A., NanoSteel, AK Steel Corporation, Nucor Corporation, MTL Advanced Ltd., United States Steel Corporation, Baoshan Iron and Steel Co. Ltd., Kobe Steel Ltd., and SSAB AB. This report provides an extensive analysis of the current trends and emerging estimations in the market. 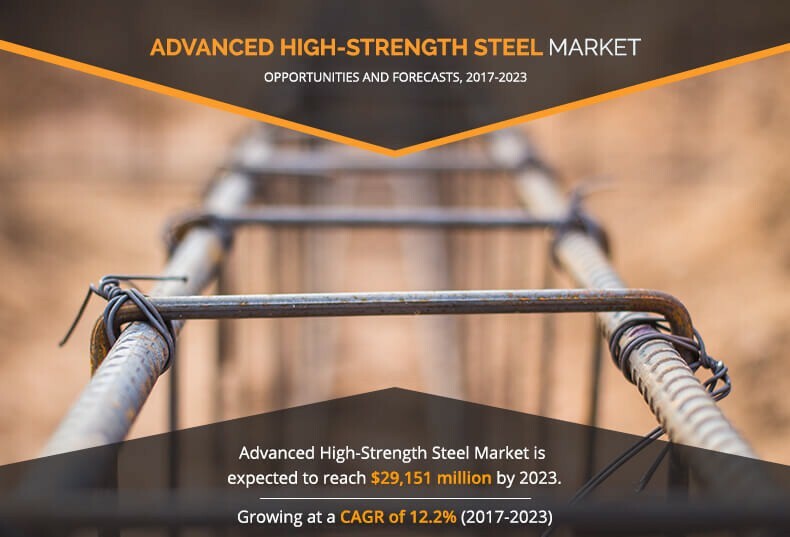 In-depth analysis of the global advanced high-strength steel industry is conducted through market estimations of key segments from 2017 to 2023. 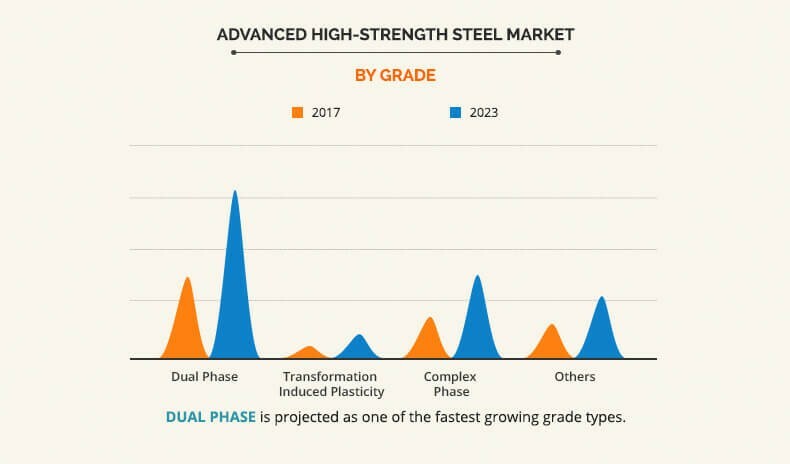 Comprehensive analysis of factors that drive and restrain the growth of the advanced high-strength steel market is provided in the report. The demand for advanced high-strength steel is on an increase in the automobile industry, as these are much stronger than the conventional steel and offer high work hardening and bake capabilities that further increase formability of part geometries. In addition, according to the leading executives, multiple steel organizations focus on R&D activities to improve technologies that are necessary for manufacturing of AHSS. This would spur the growth of the advanced high-strength steel market. A German supplier, Continental Automotive estimates growth in the global production of cars and light trucks during the forecast period. The increase in sales is being witnessed significantly in North America, Asia-Pacific, and LAMEA, while moderate growth is witnessed in Europe. Although penetration of these automobiles into households has increased over the past decade, there is scope for further gains due to the growth of the middle income group population in these countries. Based on grade types in the global advanced high-strength steel industry, dual phase (DP) steel is widely used in the global advanced high-strength steel market, owing to its high durability and ductility properties. In vehicles, these new steels play a significant role in the crash zones, which are designed to absorb the energy from the impact during a collision. Therefore, dual phase generated the highest revenue in 2016, and is anticipated to remain dominant throughout the analysis period.